This photo was taken late Sunday (October 21st). The tarp is moving around in moderate winds, but this pile has been left open all weekend with all kinds of bad weather including heavy rain and high winds. Complaints to the MOE resulted in the pile being covered up, would of been nice if it was done last Friday before the weekend. I noticed a large amount of a salt looking blotches all the my vehicles last Saturday and this happen again today, I checked the piles over on Eastport and they were covered but I called the MOE anyway to check. 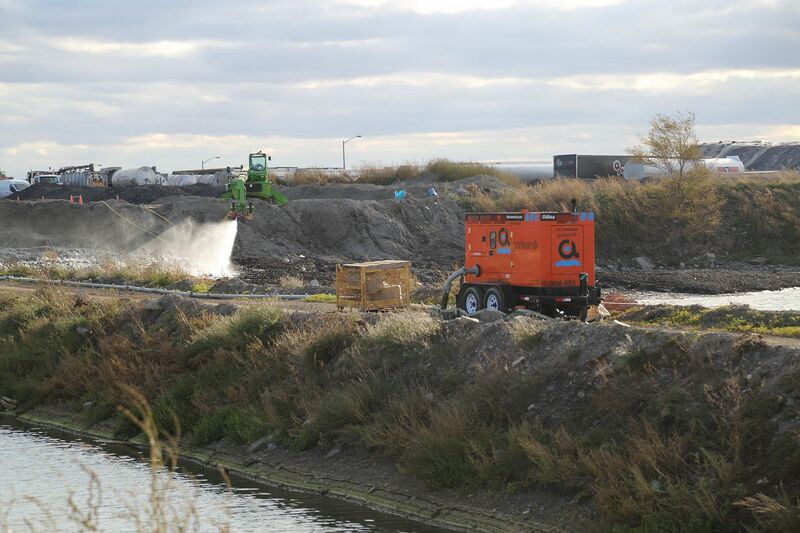 It seems the Port or their tenant are cleaning up old salt piles that have been trucked away with water from the Confined Disposal Facility (CDF) which is really a toxic waste dump. So now we are getting salt mixed with water from the CDF. came across this article today you may find a tad interesting, regarding Ontario's Environmental Commissoner's report on our water supply and contamination regarding salt ! Wonder what her thoughts would be about having our large salt shaker beside the water's edge ?? Lake Ramsey is highlighted in a recent report from Ontario’s environmental commissioner as an example of a water supply threatened by salt overload. The city’s signature water body — and major drinking water source — is also mentioned in a chapter concerning phosphate-driven algal blooms, which have caused multiple closures of swimming beaches in recent years. The 2018 report, titled Back to Basics, argues there is “much more work to do” when it comes to water quality — even for communities like Sudbury where drinking water is protected by the post-Walkerton standards of the Clean Water Act. The annual state-of-the-environment release, published by commissioner Dianne Saxe, cites fuel, fertilizer and sewage as some of the main pollutants that imperil a lake like Ramsey. It also focuses extensively, however, on a substance that might seem superficially benign but can also wreak havoc on the environment and human health: Salt. Rising levels of salt have been documented across the province, Saxe writes, including at Ramsey Lake — enough so that the Greater Sudbury Watershed Alliance was motivated to hold a public meeting earlier this year and produce a discussion paper on the subject. The alliance blames widened roads, bigger parking lots and a lack of alternative de-icing methods for more salt being flushed into Ramsey and other lakes. The environmental commissioner says in her report that climate change also has a role in the chloride spike, as extreme weather generally means more salt will be applied on roads and sidewalks. “The biggest single users are the Ministry of Transportation and large municipalities, but private applications on parking lots, driveways and walkways spread a huge amount of road salt, often with less precision,” the report states. The problem will likely just get worse unless steps are taken to reduce salt use or find alternatives, according to Saxe. To date, however, the province hasn’t shown much interest in exploring greener options. While Calgary has embraced beet brine as a less-toxic de-icer (it also bonds better to roads, apparently), Ontario “has not made a major commitment to research into alternatives” — mostly because they might cost more, the commissioner says. 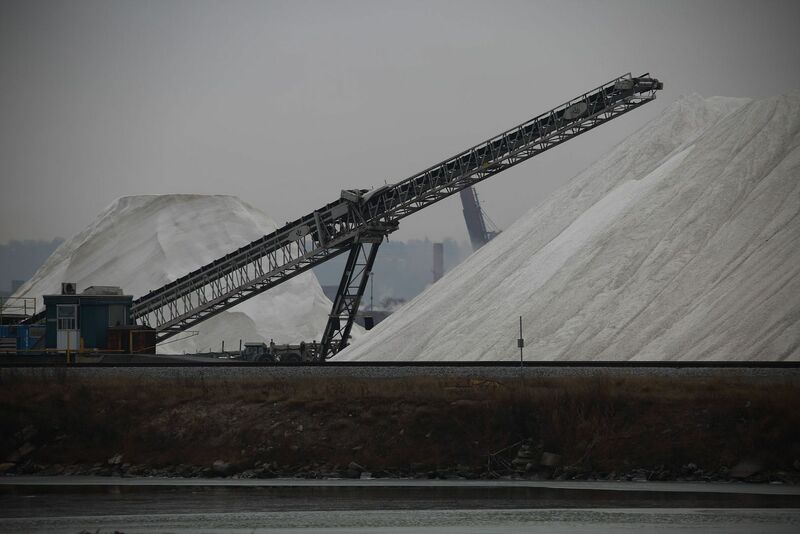 But the price tag on traditional road salt doesn’t really reflect the full cost, as it doesn’t take into account the “negative impacts on infrastructure and the environment,” the report argues. Saxe also believes municipalities should be compelled to adopt salt management plans and review and update them regularly. The biggest opportunity to reduce salt damage “probably occurs on parking lots and walkways, which are often one of the worst sources of road salt runoff,” the report points out. Research undertaken in the Lake Simcoe area showed runoff from parking lots was “four times saltier than ocean water” — in other words, very toxic. One of the problems with reducing salt use, however, is the fear, among both municipalities and businesses, of being sued in the event of an ice-related accident. Saxe said that can be addressed by liability relief, as has occurred in New Hampshire. Here, landowners whose staff or contractors have completed a Green SnowPro program — which provides training on snow-management tools and techniques that improve safety and protect drinking water sources — are shielded by state law from big litigation payouts. In general, Saxe said more vigilance is required in monitoring lakes and enforcing the rules that already do apply in Ontario. Algae-befouled beaches would be one example of our failure to protect our freshwater gems; a creek or lake so salty it can’t support a freshwater plant or fish would be another. “Our environment is sending us a message,” the commissioner says. What would she think about having all that salt beside her house, good find! 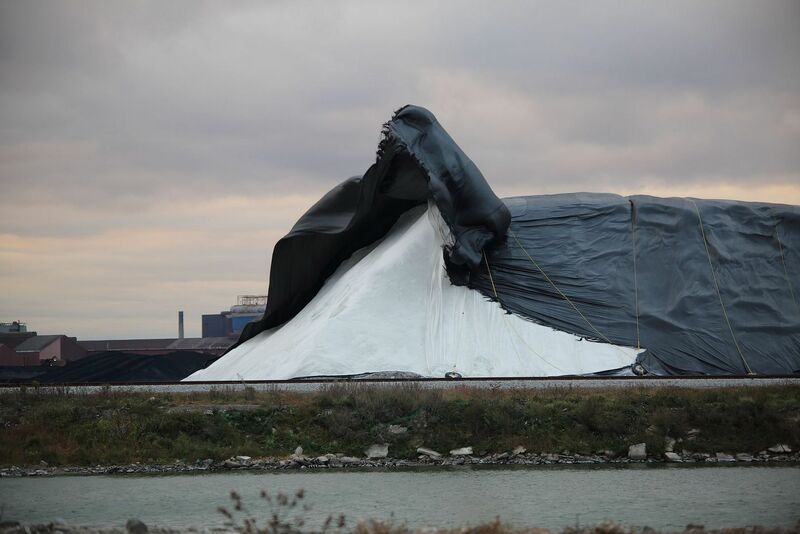 From November 25th, the Salt company and the Port have stopped inbound ships from listing their location on AIS, this pile appeared late last week. I will have to watch the ships a little better. We have been getting some light dusting of salt on our properties and I have asked the MOE to check this pile for proper coverage. On December 12th this pile was moved over with another pile, this took a few days and the winds were mostly moderate out of the west. Published on December 24, 2018 by Elise Mackie. Around Lake Ontario, winter-weather forecasts bring out road salt. This means crunchy sidewalks, dog booties and salt-stained shoes. It also means severe impacts for Lake Ontario’s watershed and its aquatic life. When rain or snowmelt wash road salt (sodium chloride; Na-Cl) into storm sewers and water ways it causes a damaging spike in salinity. The image was taken by markgranitz. It illustrates the typical overuse of road salt on the sidewalks. In Ontario, we use road salt to de-ice sidewalks, roads and parking lots, and to improve safety during winter temperatures. However, it’s used in excess more often than not and is turning freshwater into saltwater. The salty waters can get into groundwater supplies, kill sensitive species, and ultimately degrades ecosystems. Spots in Ontario have become so salty that there have been sightings of salt-water animals in the freshwater creeks. Reports of saltwater blue crabs living in Mimico Creek is just one troubling case that illustrates the extent of sodium chloride pollution in watersheds of Lake Ontario. As the salt makes the freshwater livable for saltwater species, freshwater species are increasingly at risk from spikes in sodium chloride levels in winter months. Research shows the salinization of freshwater causes increased parasitism on the North Leopard Frog, a native amphibian to Ontario. In salmon species, sodium chloride stops growth at the most important life stage, which corresponds with drops in salmon population sizes. In the worst cases, research shows salinization of freshwater leads to mortality in small aquatic species like freshwater shrimp, mussels, and insects. Freshwater ecosystems rely on these animals because they feed the larger animals like fishes and birds. When the populations the small aquatic animals drop as sodium chloride levels increase, the population levels of larger aquatic animals also drop. 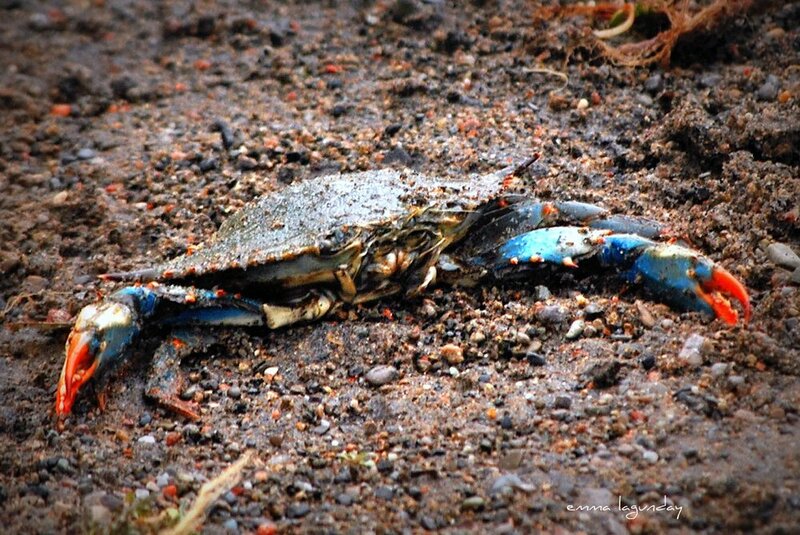 This causes major changes to the food web and damages the overall aquatic ecosystem. All-around road salts cause permanent changes to the aquatic ecosystem, including tremendous losses in biodiversity. How much road salt is enough? In Ontario, the solution right now is to use less road salt on driveways, sidewalks, and paved parking lots. The over-application of road salt is common and unnecessary. 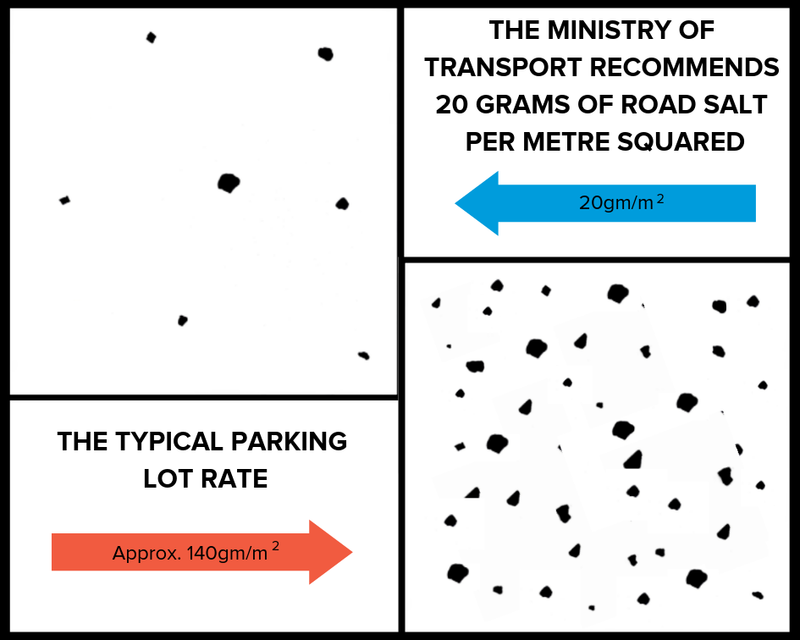 The illustrations below show the average rate at which the Ministry of Transport applies to roads (top left) and the over-application typically seen in parking lots (bottom right). These illustrations come from a recent presentation by Tim Van Seters on the Lake Ontario Evening November 22, 2018 titled Salting the Earth: The Unintended Impacts and What We Can do to Prevent Them. Most of the public is simply unaware of the impacts that road salts have on the local environment. Plus road salts are really cheap and there is a general lack of application protocol and enforcement. These factors often leave us prone to excessive application during the freezing winter months. Shovel first. Shovel all the snow you can. You may find you won’t need that much salt at all. Be mindful of the amount of salt you use: 20 grams is approximately one handful of salt. Use salt on ice only. Avoid applying salt near plants as you could heavily damage them. Be mindful of the salt that collects on your car. Washing your car can lead to salt flowing off into a storm drain. Limit the frequency you wash your car in winter and “Skip The Wash, Save The Lake”. Salt harms Lake Ontario and every winter. In response, Toronto Honda and Toronto Kia launched a campaign in collaboration with Lake Ontario Waterkeeper. Skip the Wash, Save the Lake, reduces water pollution and the number of car washes at both dealerships. Toronto Honda and Toronto Kia donate to Lake Ontario Waterkeeper for every wash skipped. Donate now and you too can support the cause! Took my car to the car wash yesterday and today (January 16th) it was covered with a substance looking like salt, checking the salt piles on Eastport showed them to be uncovered at one end and tarp was blowing around in the winds. 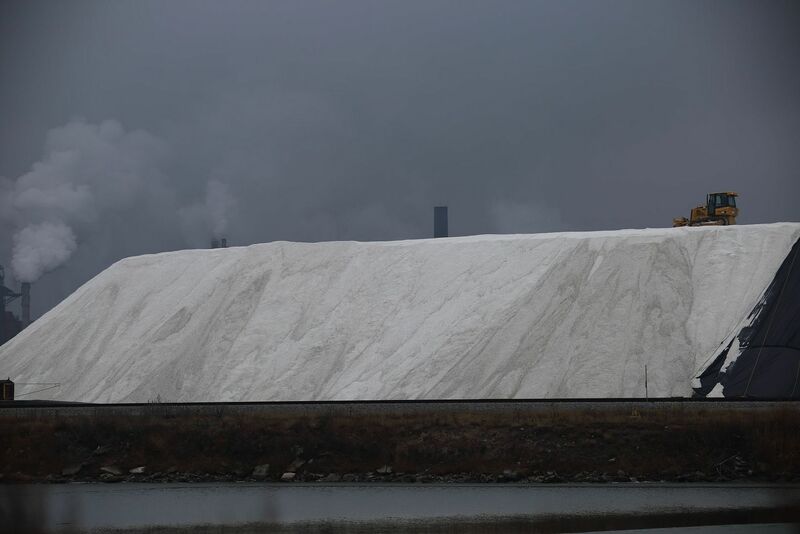 It is Super Bowl weekend and the salt pile has been left open for the whole weekend, winds hit over 45 km out of the WSW. Notice the tarp still blowing around in the wind. Once again another dusting of salt on our just washed vehicles last Friday (February 8th), a visit to Eastport shows the pile open and loader filling trucks. Notice the dust during the loading. At 3am the winds hit 55km out of the WSW. The pile was left open for the second weekend in a row. Checking on the next day the main tarp was completely blown off leaving only the secondary tarp. 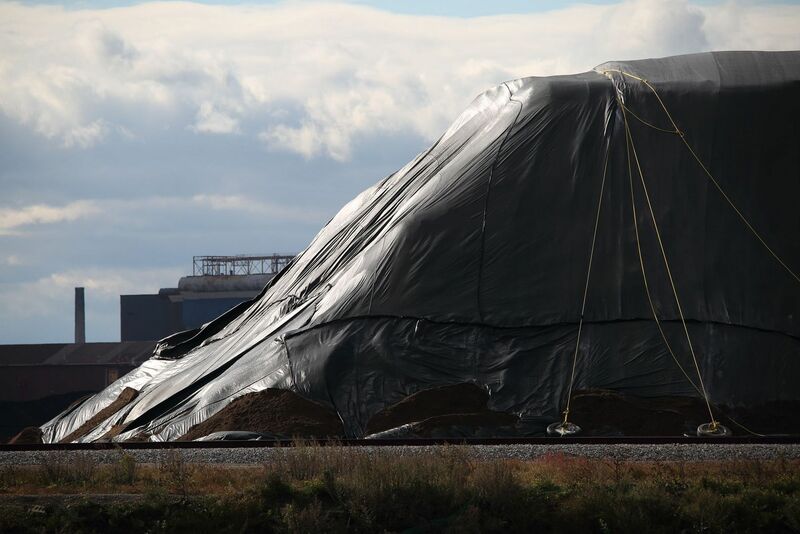 Checking Eastport last Friday 15th, the pile was getting smaller but wide open to winds, it did get covered up the next day but the tarp blew off again over the Family Day weekend. 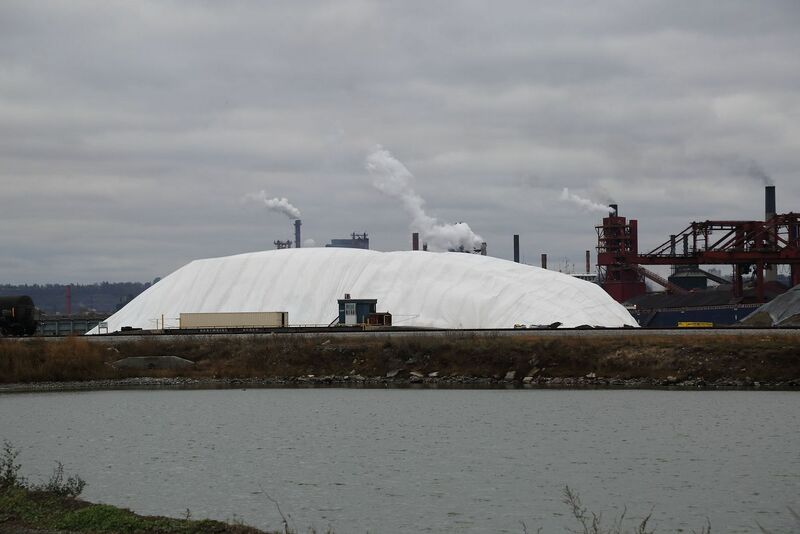 any bets on your beloved salt mound, that it will be securely tarped before Sundays storm. Winds are expected to be WSW with gusts 80 km +. That would mean anyone living from Rembe Ave / Harry's Pub to the lift bridge in the potential fallout zone ! I was hoping that it was completely gone, but any residual dust will impact our community. It would also be nice if the pile never comes back. This is what is left of the pile as of Saturday (Feb 23), most of the pile is covered but as Opie stated there are some high winds out of the west coming. Today the Skyway has a severe wind warning and the pile is still mostly covered with some salt exposed. 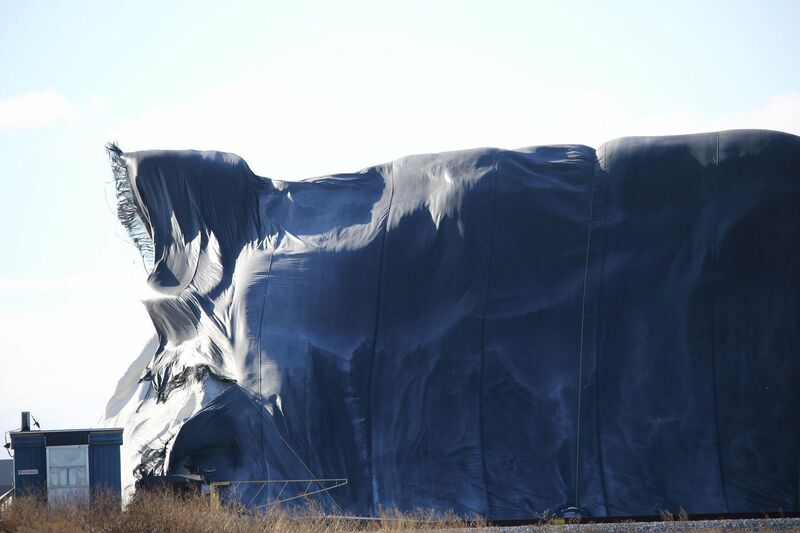 As expected, the tarp on the salt pile did not hold with these high winds and there was a lot of salt impact on our community.